Hello all! 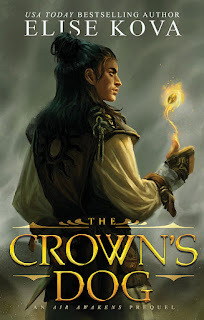 Today I am happy to share my review of The Crown's Dog by Elise Kova. The Crown's Dog is the new prequel series to the Air Awakens series, featuring the Golden Guard quite exclusively. I was over joy to get the chance to read this book as an eARC so I thank the author Elise Kova for sending me a copy. Description: The first in an Air Awakens prequel trilogy. Yet another Air Awakens book you say? I do, I do indeed. The Crown's Dog is the first in a new prequel series that closely revolves around the Golden Guard. Within the first book we are exposed to POV's from Jax Wendyll and Erion Le'Dan. I personally really enjoyed the fact that Elise took to writing and showing both POV's I felt like it enhanced the story. In general I am giving this book a 4 out of 5 stars. There were a lot of key things that made me love this novel, however I do believe there were a few hiccups along the way. I believe the story line aspect of this book was hit spot on. It was interesting to see a different set of characters in the Air Awakens world. Especially characters who I really enjoyed the first time around. I believe the story allowed for mystery and intrigued all the way through. Jax, Erion, and Baldair travel to the young princes summer home in order to pursue lost treasure. Treasure that was left behind by a pirate who's name is not to be said. We as readers witness a summer meant to be filled with fun and treasure hunting, turn into a summer filled with finding a girl's murderer. I believe Kova did a good job at leaving this girls death a mystery and leaving an ominous feeling throughout the book. The pace I believe was set perfectly. We got enough time and background story to jump into the book, and it didn't rapid fire information either. The story was told between two POV's, Jax and Erion. I believe this really balanced out the book. We got the backstory of two amazing Golden Guard members, who we saw in Air Awakens. When starting The Crown's Dog, I found myself to be very excited for Jax's chapter, but near the end I ended up finding a new love for Erion. His character really intrigued me, and I was just soaking in all the information about him. So overall both POV's were portrayed very well. My only concern was the feel of the actual world and setting. I knew we were in the Air Awakens world, because of the names, characters, and places, however I didn't feel it like I had in the Air Awakens series. Whilst reading that series I was transported right away, however with The Crown's Dog I didn't read that easy transport like I once had. It eventually got there as the story went on, but unfortunately not as quickly as I have felt before from this author. Overall however that was the only hiccup I found with this book, and even then I still fell in love with the story. I seriously fell hard in love with Jax in Earth's End. He has sass, and humour and oh a dark side (But like a dark side that also has a sweet side). So you can only imagine my excitmnt when I found out he was to be one of the main guys in this book. He was one of my favourite characters, only because of his man bun.. well maybe not just the man bun. Anyway, I did love his character a lot. So getting some more back story was like the cherry on top of a sundae. Now another character that we saw in Air Awakens was Erion Le'Dan, to be honest, I enjoyed his character but I definitely did not have the respect for him that I now have because of this book. We saw the thought process of this brilliant man, and all he has to offer. I will also totally say that Erion is definitely me in my friend group. Then after these two wonderful characters stole the show we also had Baldair to swoon over as well. He has always been an entertaining character to read about. He has that certain SWOON factor that just never leaves. The three of them together was inspiring, they all fit together perfectly and each brought out the best in each other. In conclusion, despite the minor hiccup I had with this book, I REALLY loved it in the end We got to see many different elements of the Air Awakens world in this new prequel series. Besides the beautiful words written in the book, the actual cover was also absolutely beautiful as well. I highly sugguest checking this book out if you loved the Air Awakens series. "Something had changed in their eyes that would never return to what it was." Nice review! I, too, thoroughly loved getting to know Erion. While I loved Jax once again, it was Erion that I feel like I got to know for the first time.